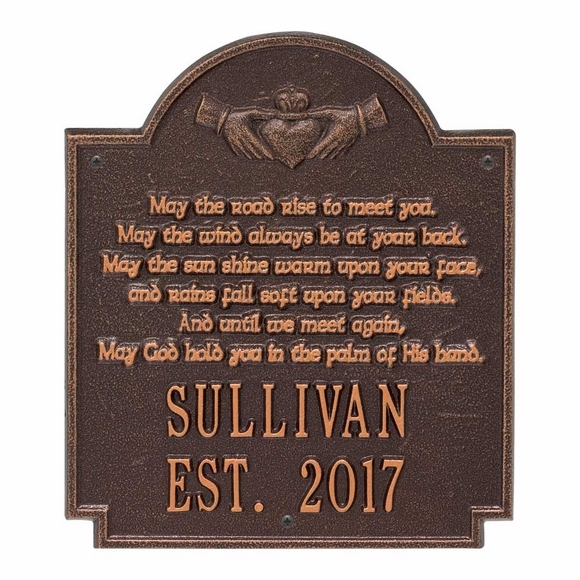 Claddagh Poem Wall Sign - - May the Road Rise to Meet You plaque personalized with the family name. A perfect way to celebrate a wedding or special anniversary. Wall mount 12.25"W x 10.75"H. Made in USA. Handmade, premium grade aluminum casting. Line 1 for the family name holds up to twelve (12) 1.25" characters. Line 2 holds up to nine (9) 1.25" characters. Dimensions: 12.25"W x 10.75"H x 0.375". Claddagh Poem Wall Sign. Celtic theme family established sign made in USA.